We are all broken and in desperate need of repair. The process that God uses to make us new is not to simply correct our specific problems or do a minor touch up job on the surface of our lives. God is satisfied with nothing less than complete renewal of our beings. 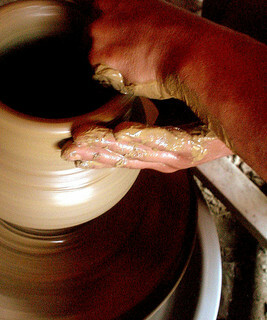 God says “Behold, like the clay in the potter's hand, so you are in My hand...” (Jeremiah 18:6). This process of renewal requires that our old selves be put to death and that we be raised and remade in newness in Christ. This is difficult and often painful. Another analogy is that of an armorer making a sword. He starts with raw metal that is unformed and riddled with impurities. He must first, with fire, smelt the metal to remove impurities. He then begins to shape the metal and fold it over and over again making it stronger. The process is violent involving extreme heat, fierce molding, then shocking cold. It is continued until, after much labor, he has finally formed the sword into the shape that he desires. The process, however, does not end here. The maker must now take meticulous care to put a fine edge on the sword and polish it to a perfect shine. None of this happens quickly. It may take years for a dedicated master sword-maker to complete a single masterpiece. So too are we like clay in the potter's hands or like raw metal being fashioned into a perfectly tuned instrument for God's purposes. The process of molding us into the shape that He desires is often difficult and painful, but you are never closer to your maker than you are when being shaped by His hands. Are you going through a difficult and painful trial? Remember that, though we do not always understand His will or see His purposes in this life, God is ever present and is using every situation that we find ourselves in to mold us into the people that He has chosen to spend all eternity with. For momentary, light affliction is producing for us an eternal weight of glory far beyond all comparison (2 Corinthians 4:17).